Tweak says, "Is it time to get down...."
Pets are odd, right? I can't be the only one with an odd pet. 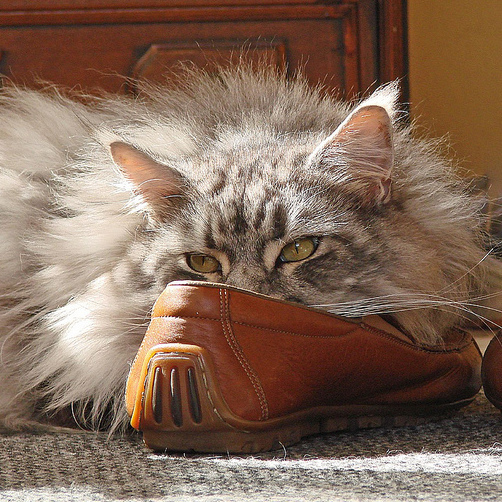 Shortly after I took that, he dragged the shoe off and I've yet to find it again. I understand where the desire to roll over my shoes comes from (marking territory; comfort), but the kidnapping of just one? He could have taken the other for a matching set. (He didn't. He left it alone.) I assume he must have an incredible hoard of both junk AND things I actually needed and had to replace when he ran off with them/hid them forever. So what's the strangest thing your pet's done? Or worst. Any story will do. by the way), but I wanted to mention a few things. First, I've been working on my stockpiles of potions and ingredients for a couple months now, just in case I ever started to have trouble acquiring anything - I may have gotten ahead of myself, but I'm not about to be caught unaware. If there's anything we need in particular, please let me know.